I enjoy visiting shrines. They’re peaceful places where I can find silent solace away from the hustle and bustle of life. One of my favorite shrines I’ve ever visited is National Shrine Grotto of Our Lady of Lourdes, tucked away in the Catoctin Mountains in Emmitsburg, Maryland. Our Lady of Lourdes Shrine is located at Mount St. Mary’s University along Route 15 — between Thurmont, Maryland and Gettysburg, Pennsylvania. While many visitors are Catholic such as myself, National Shrine Grotto of Our Lady of Lourdes is a place of beauty that can be appreciated by anyone — whether you consider yourself religious or spiritual. National Shrine Grotto of Our Lady of Lourdes in Maryland is perhaps one of the most well known shrines in the United States. It’s a replica of the iconic Our Lady of Lourdes Shrine in France. My family and I had heard about Our Lady of Lourdes Shrine in Maryland while spending the summer of 2009 in Newark, Delaware. My mom was undergoing experimental chemotherapy treatment at Helen F. Graham Cancer Center on the Christiana Care Hospital Newark campus. After completing what had been a very dicey couple months of treatment, my mom wanted to take a side trek to National Shrine Grotto of Our Lady of Lourdes in Maryland on our way back down Interstate-95, en route to our home in Florida. 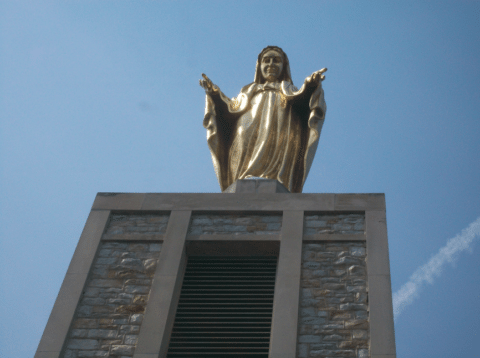 Upon arriving at the shrine after a trek along scenic Route 15 in Maryland, we were greeted by Pangborn Memorial Campanile — which is topped with 25-foot, gold-colored bronze figure of the Virgin Mary. From there, we began our 2-hour exploration of the shrine and its beautiful grotto — which date back to 1805. It’s where Father John DuBois, of France, built a church called St. Mary’s on the Hill. A few years later, Elizabeth Ann Seton (the first native-born American canonized as a saint by the Roman Catholic Church) took up residence there while her house was being built in nearby St. Joseph’s Valley. Father Simon Gabriel Brute began working on beautifying the Lourdes shrine grotto in 1812. Further enhancements were made throughout the rest of the 19th century — including the creation of the gardens and winding footpaths that now help make the National Shrine Grotto of Our Lady of Lourdes such a serene place today. The grotto was for many years a very secluded spot on the Mount St. Mary’s University campus. Following restoration efforts by Monsignor Hugh J. Phillips, the Grotto of Lourdes shrine opened for all to visit in 1958. The grotto itself is located a few hundred feet away from the shrine’s parking lot and is accessed via a tree-shaded footpath called Corpus Christi Lane. 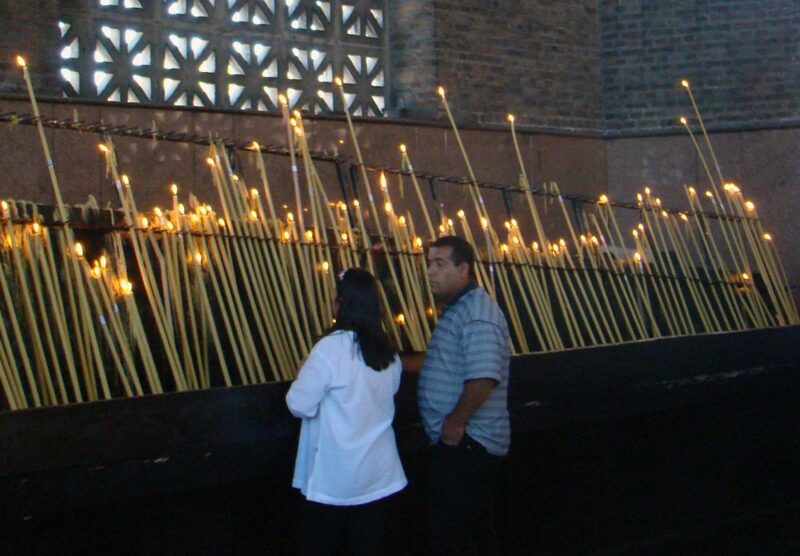 Inside the stone grotto cave, you can light a votive candle and place a prayer request for a special intention. 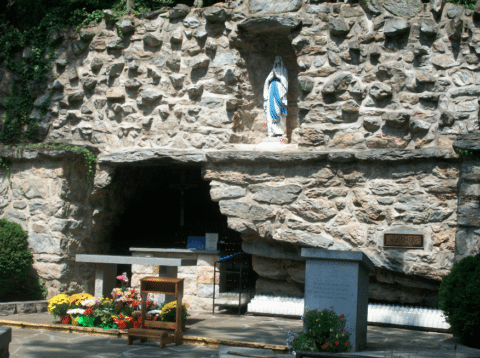 A faithful replica of the original Lourdes Grotto in France, this is one of the most beautiful places at the shrine and a wonderfully serene place to say a prayer, reconnect with your soul, or collect your thoughts. Nearby is the majestic Calvary crucifix, which reminds those who believe in Jesus as a savior that he suffered and died for the sins of mankind before rising again 3 days later. I also spent a little time praying in the humble, stone Corpus Christi Chapel. It’s a most peaceful place that looks like something you’d see in a Norman Rockwell painting or Thomas Kinkade Christmas village. Next to the Corpus Christi Chapel is a font of grotto water — which is significant because it pays homage to the water at the Lourdes Shrine in France that many believe has healing properties. Along Rosary Lane are several statues and smaller shrines dedicated to the memories of saints and other venerated figures in the Church. The Stations of the Cross and Mysteries of the Rosary can be viewed along the this trail, too. The Rosary is a string of beads used chiefly by Catholics and instructive in helping the faithful recite a series of prayers for special intentions. If you like praying with the Rosary, this is a most peaceful place to do so. It’s possible to pray the Rosary in less than 30 minutes. Depending on how much time you have to spend at the shrine, your purpose for visiting, and your interest in the shrine itself, your visit could range anywhere from an hour or two to as long as a weekend or more. It’s a place where faithful could easily spend a day in prayer or contemplation, or where tourists who have more of a passing interest in visiting shrines could sit and respectfully collect themselves. No matter your reason for visiting National Shrine Grotto of Our Lady of Lourdes, it’s important to remember that it’s above all a sacred place to the many who travel from all over the United States and even various parts of the world for the sole intention of prayer and pilgrimage. For that reason, there’s special etiquette you could use when visiting a shrine so you can get the most from your visit without disrupting other visitors. These are useful tips that are ideal for visiting any shrine or other sacred places of any religious or spiritual setting. #1 – Be quiet. Be peaceful. With few exceptions, the most appropriate demeanor for visiting shrines, houses of worship, and other spiritual places is that of peace and contemplation. There are places where more exuberant forms of worship and expression are appropriate, though these are relatively uncommon in the United States. Etiquette: Mind Your Manners in Church! Be sure you’re dressed respectfully before visiting shrines, houses of worship, and other sacred places. For example, I wouldn’t recommend visiting a seaside church in swim trunks or a bikini. Perfect attire for the beach… maybe not so much for respectful prayer or contemplation at a house of worship! I encourage you to check out what the proper attire is ahead of time for the shrine, house of worship, or other sacred place you’ll be visiting. #3 – Be careful when taking photos or videos. You’re visiting a touristy place, so surely it’s OK to take photos, right? Not necessarily. At the very minimum, it’s wise to ask first if you may take photos. I’ve been to churches where the use of cameras is strictly prohibited. When visiting shrines or temples, I’ve always inquired on whether or not it’s OK to take photos before doing so. For example, in the Islamic faith, images of certain events and figures is strictly prohibited. And in other spiritual followings, there are occasions where taking photos is at the very least an intrusion of one’s personal moment of peace and solitude. This was an area I wanted to research beyond my own personal experiences, and in doing so I came across this helpful, concise guide on discreetly photographing religious events. Perhaps you’ll find it useful when visiting shrines, houses of worship, and other places where the faithful or spiritual gather. #4 – Make a small donation. Many shrines, houses of worship, and other spiritual places survive on very little money. Even specific churches or other sites that belong to major religious organizations such as the Catholic Church aren’t necessarily well supported financially — despite common belief in pop culture. That’s in part why many of them end up closing. So, if you’re visiting spiritual places, churches, or other religious landmarks, contribute something if you can. It doesn’t have to be a grand financial gesture. Even $1, $5, or $10 can help pay for the upkeep of the place where you’re spending time to find inner peace.